Today, we spent the day at The Ripley Academy, creating Chinese food and exploring life skills. We have created Spring Rolls and Savory rice as well as exploring how bank accounts and budgeting works. Thank you to the staff at TRA - we had a wonderful day and had the great opportunity to get used to what may be our new school! The children are really excited to visit again. We've had a great day exploring Kensuke's Kingdom in more detail. We have explored the character of Michael and Kensuke, created Japanese art using stones and various mediums and wrote persuasive letters to allow Michael to travel the world. Well done everyone - some wonderful, imaginative costumes too! This term we have been working on developing mindfulness. We've learnt about what it is and how it can help us handle difficult and stressful situations. The children have worked really hard to develop these skills and think about ways in which we can use these techniques in the future. - Taking the time to notice and appreciate every day activities. - Body scans - identifying how we feel and recognising different parts of our body. - Focusing on activities which require us to make specific actions. This week we have been lucky enough to have a music teacher from Aldecar High School teach us some djembe drumming. With the help of some very kind Year 11 students, we learnt how to strike the drum to make different sounds and how to create a simple tune. Here are some photos of use enjoying our day, and a few videos of our work. Thursday 28th September was National Poetry Day. 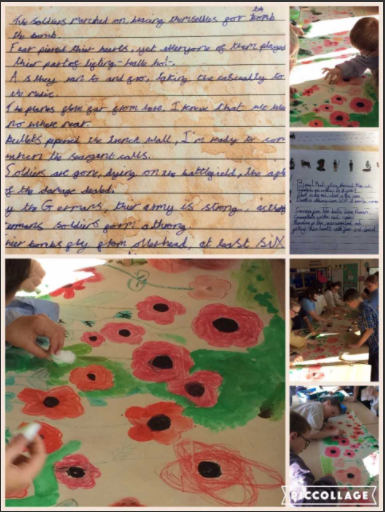 All of Year 6 looked at War poetry and then took the opportunity to write our own. During the afternoon we created our own class poppy banners, which we have displayed in the corridor. We had a great time using both pastels and paint to create some super artwork. Our first brain builders challenge was: What makes a good friend? Have a look at some of the brilliant interpretations of our question. Well done everyone! We've had a great first week in Year 6. This week we've been revising key objectives from Year 5 in English and Maths. We have also began to investigate how different religions explain how to look after the environment by reviewing key themes in the Christian creation story. 6RT have also completed their Bikeability course, focusing on how to stay safe when cycling on the roads.